PEMF Settings Omnium1 Android Tablet are very important to get clear on right from the beginning. 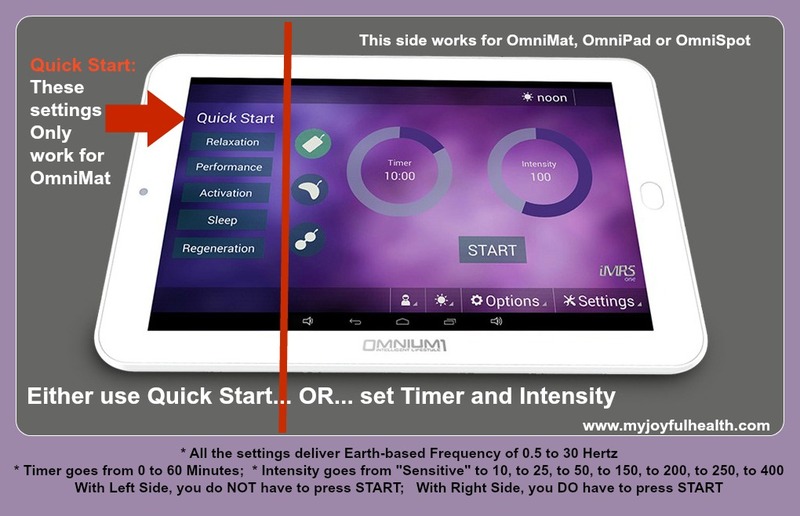 Important: Time, Intensity and Frequency when using the Swiss Bionic Android Tablet for the Omnium1 Mat (OmniMat), OmniPad, and OmniSpot. When you use the Android Tablet, note that the Left Side is used for the OmniMat only. You use Either the Quick Start settings on the Left OR the Timer/Intensity Settings on the Right! 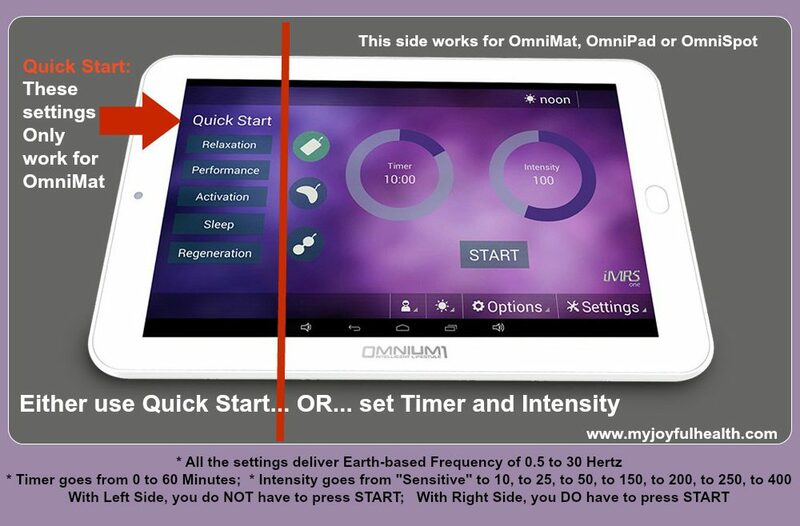 LEFT: Quick Start Settings – for Omnium1 MAT only. Relaxation, Performance, Activation, Sleep and Regeneration. Allie Ochs, recorded by PEMF Diana Walker in Vancouver June 2017. Your device knows what time of the day it is when you go on the Mat. There is a 3 hour difference when I travel from Ontario to British Columbia. I have to change the time zone. That is the “radio station”. That’s given. The Intensity is — how loud do my cells need to hear the “radio station” (frequencies) to respond? How loud do my 75 trillion cells on the PEMF Omnium1 whole body mat need to hear this beautiful music to resonate? The all-time Favourite is 8 minutes and Intensity 25 in the morning, and 8 minutes and Intensity 10 in the evening. We need you to be on the Omnium1 Mat a minimum of 8 minutes so all your 75 Trillion Cells can Resonate. You may have 1 Trillion Cells resonate one second. 30 Trillion Cells after 3 minutes. Whole job takes 8 minutes. This also answers the question – “Why don’t I feel anything when I’m on the Mat? Well, when you talk on your cell phone you don’t feel anything either. You’ve got much higher frequencies. You can’t feel ElectroMagnetic Frequencies; most people can’t. It doesn’t matter whether you feel anything or not — what is important is what you feel and what happens to your body when you get off. In North America we always want to feel something. What do you expect? Out of the 250 PEMF Manufacturers worldwide, Wolfgang (Founder and CEO of Swiss Bionic) says that 240 of them are not electrically safe (no CE certification) and that Swiss Bionic is the only one compliant and certified by Health Canada as a “Medical Device” (other companies don’t have the money to seek certification as it takes lots of work, documentation, money and clinical evidence). It is technology proven by NASA and Recognized by the FDA, as well. Hi Glenn, Thank you for your question. As you know, the Swiss Bionic Omnium1 Full Body Mat “recharges” all cells in the body within 8 minutes. For further regeneration and helping the body to self-heal, it is good to go on for even longer periods of time. My favourite is 24 minutes of Regeneration or Relaxation. We do not provide recommendations for specific treatments. Your client may want to use the OmniPad in addition to the OmniMat. Hope that helps!